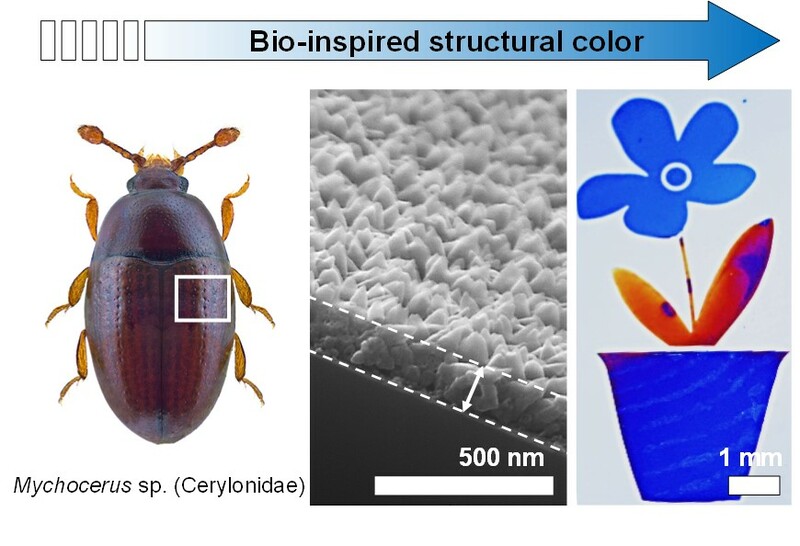 Research conducted by Professor Geunbae Lim from the Department of Mechanical Engineering at Pohang University of Science and Technology, in collaboration with Professor Taechang An from the Department of Mechanical Design Engineering at Andong National University, has successfully developed a new and cost-effective method for obtaining biomimetic structural colors with the ability to finely tune the completed structures. This achievement has been published in the world-renowned ACS Applied Materials & Interfaces. The team used quasi-ordered scattering—the phenomenon where a constructively reflected wavelength is observed when nanostructures with the same size are uniformly distributed over an irradiated area— through ZnO nanostructure fabrication. By successfully synthesizing ZnO into desired shapes through selective growth and etching, the team discovered the technique for large-scale and flexible fabrication of structural colors. The synthesis process and the resulting nanostructures can be fine-tuned by controlling the time and reagent concentration, and furthermore, masking techniques allow for the application of different structural colors on the same surface. Professor Lim remarked on the noteworthiness of this research because the proposed method has overcome existing limitations and is expected to be applicable to many fields including the eco-friendly fabrication of microelectrodes, sensors, and anti-tampering tags.